The wind direction changed in winter 1939/40 because the nearby seas had been effected by naval war ? At this stage it might be worth noting the research made by Drummond for Kew Observatory (London) in the early 1940s, that of the prevailing wind directions in South-West England during 155 winters from1788 to 1942 only 21 had easterly resultants whereby the few winters 1814, 1841, and 1940 had resultants from NE to ENE, meaning northerly than East. 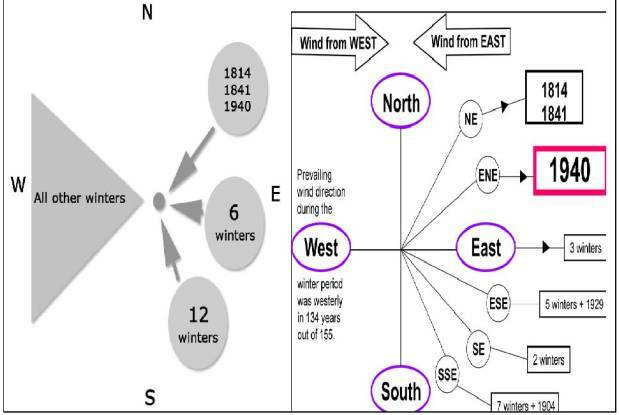 Another little number of winters since 1841 (1845,1870,1879, 1891, 1895, 1904, 1929) had prevailing SSE to ESE. With the exception of the winters 1801 and 1804 all of these 21 winters with predominant easterly winds had a temperature below average (40,1°F; 4,5°C). While eleven of the above winters had means between 34°F and 36°F, only few westerly resultants had means lower than 37°F, these being 1820, 1830, 1847, 1855 and 1886.